Looking for a little excitement……this wasn’t the game for you. Looking for a full dose of excitement….. this was the game to see! 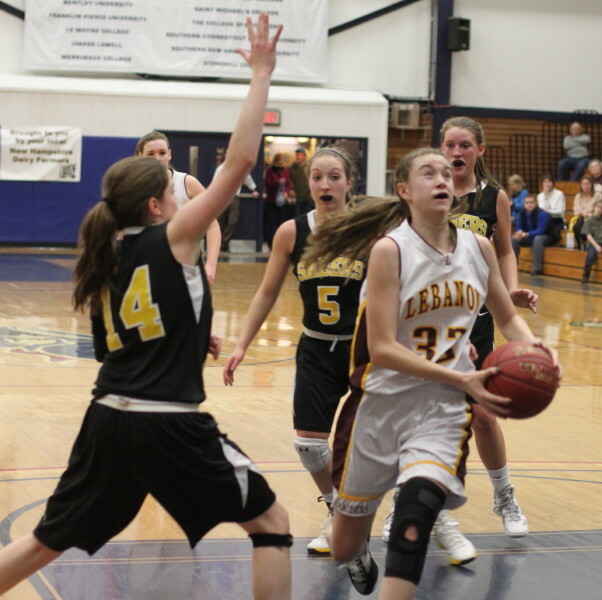 Until Souhegan’s Ashley Tighe had the rebound in her hands after two near misses by Lebanon, and the buzzer went off, this game’s winner was undecided. 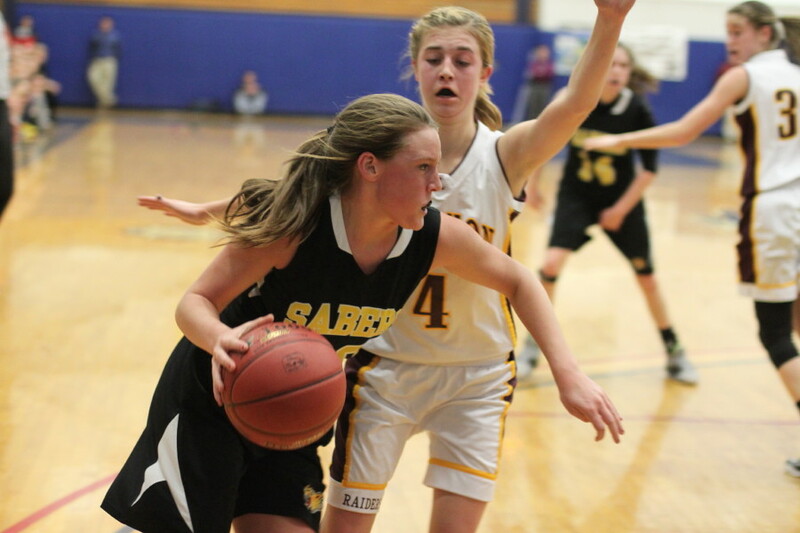 But the game ended with those Raider near misses on Monday night at Southern New Hampshire University and 2011 champs Souhegan (17-4) will now line up against #5 seed Kearsarge on Friday (7PM) and try to win another D2 title. This was an extremely painful loss for the #2 seed, 19-4 Raiders. 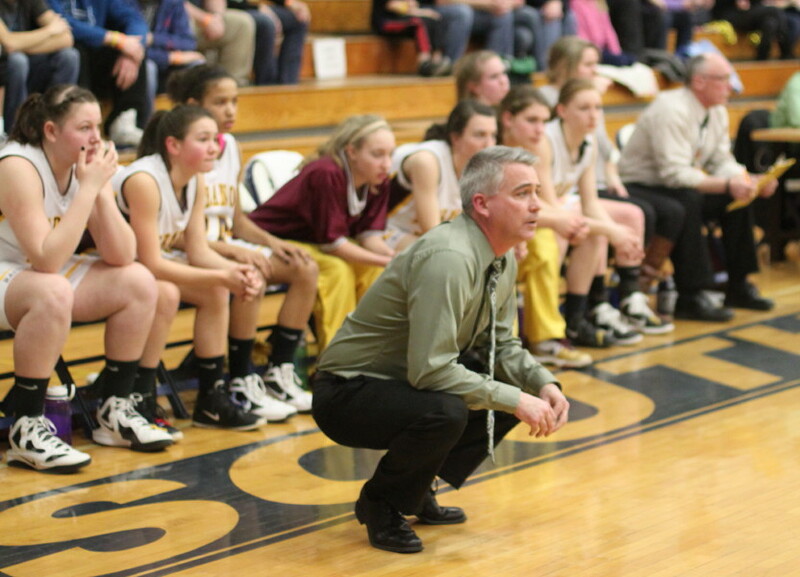 They were riding an eight-game win streak and had defeated Souhegan during the regular season. Lebanon went down 10-1 in the first 4 ½ minutes but came all the way back to tie the score (26-26) two minutes into the second half. Back down they went by eight (37-29) and back they came to tie the score (43-43) with 4 ½ minutes to play. So you can see that the emotional roller coaster was operational for both teams. And the ride hadn’t even reached the most exciting part! There was a tie at 45 and then a Moriah Morton free throw gave Lebanon a 46-45 lead with 1:47 left. Could the Raiders hold on? No, and if you want to blame one person, the Sabers Jane White (23 points) would be at the top of the list. 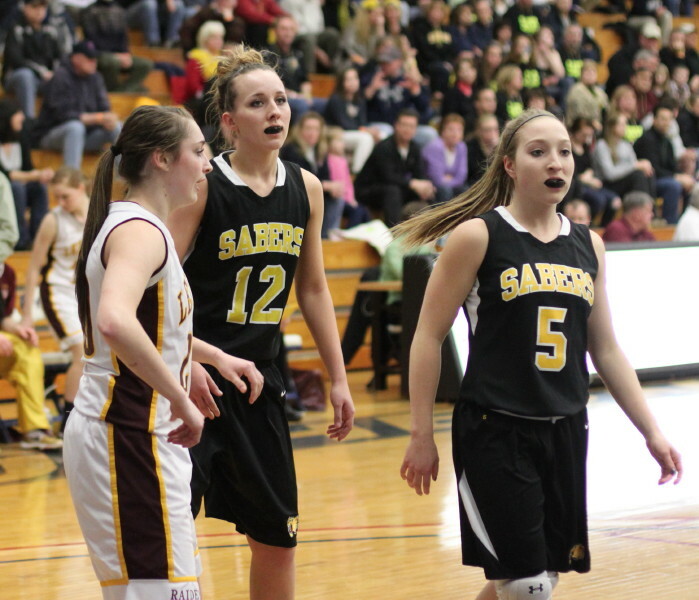 The All-Stater had gotten to the basket five previous times and you knew that down one she would try again……….and she did successfully and it put the Sabers in front, 47-46, with 1 ½ left. Moriah Morton (13 points) made one of two free throws but the score was tied at 47 with 1:26 remaining. Again back to the blame game. 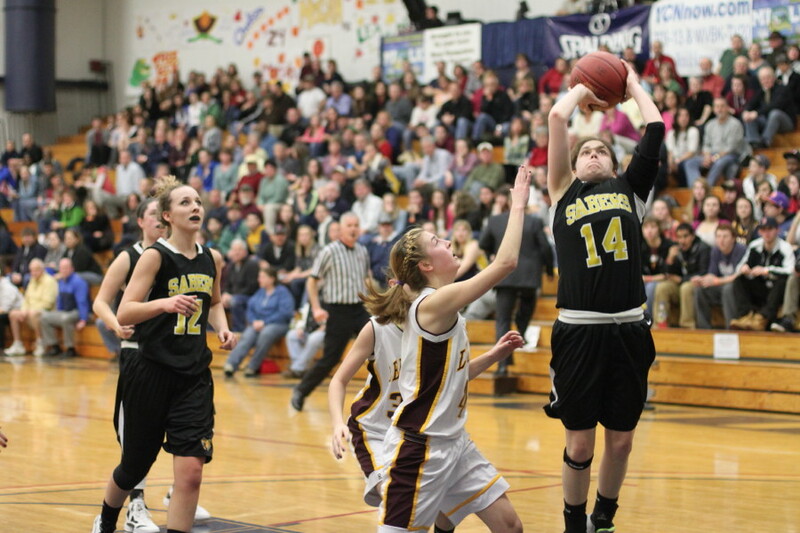 Souhegan is in a tie game and they have the ball. What will they do? You guessed right. 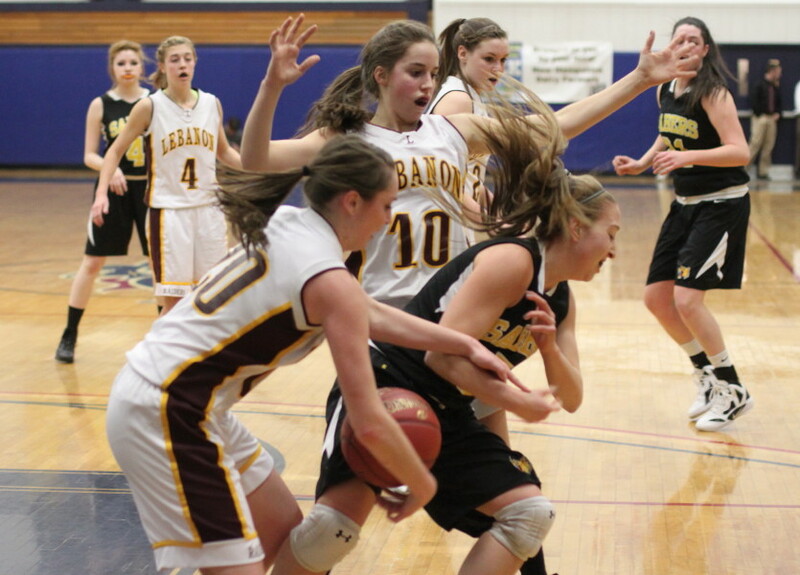 Give the ball to Jane and get out of her way! She was able to get into the lane, draw contact, and then sink both free throws (49-47) with 1:07 left. Plenty of time for Lebanon to respond. With thirty seconds to go Samantha McDonald was fouled by Victoria Forest (her 5th). She made the first and missed the second (49-48). The missed free throws (three in the last 1:47) were significant in a one-point loss. 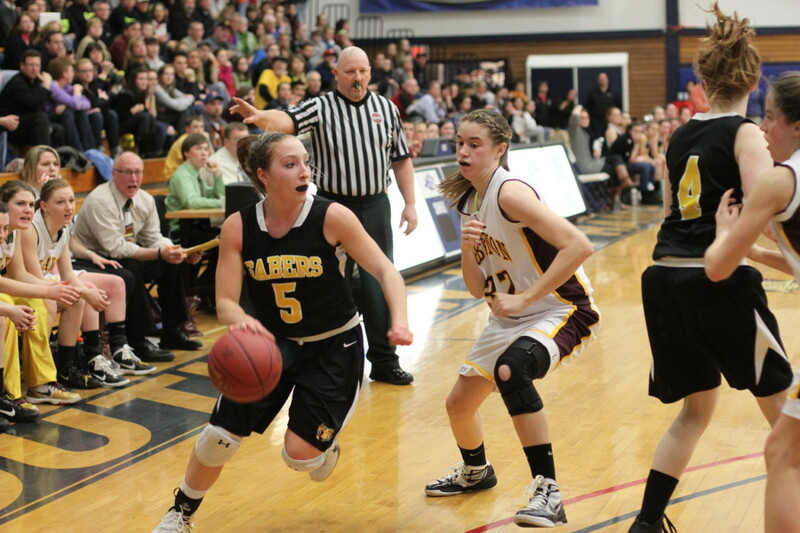 Down by a point, the Raiders fouled Ashley Tighe with fifteen seconds left to face a pressure-packed one-and-one. 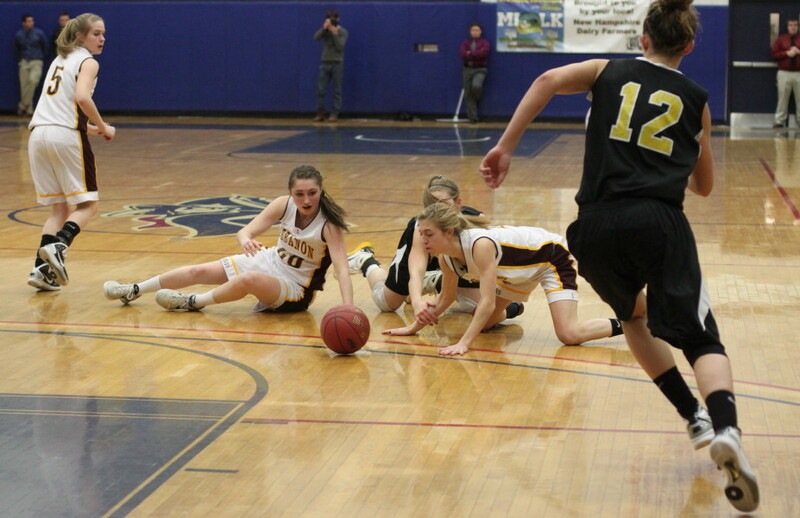 (The unfortunate part here for Lebanon was that Moriah Morton (13 points) did the fouling and it was her 5th.) Ashley missed the front end and again Lebanon had time (fifteen seconds) and needed at least a point. There was no timeout called….probably none left. The Raiders passed the ball around the outside before Taylor Friedman (10 points) took a 15-foot jump shot from the left with less than five seconds left. It missed but the rebound came directly to Colleen Taylor on the same side along the baseline. Colleen’s quick shot hit the metal on the back of the rim and went off the other side into Ashley Tighe’s hands as the buzzer sounded. I told you it was a very exciting game! 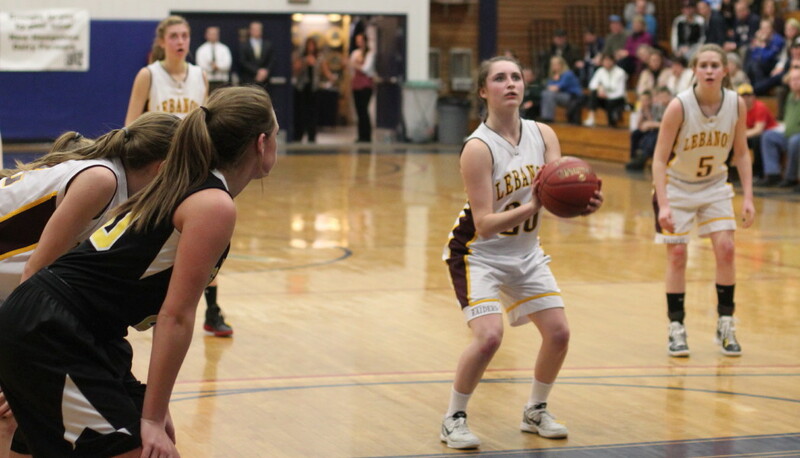 Jane White led all scorers with twenty-three points, including fifteen in the second half. Included in those points was a shot from her knees in the lane in the third quarter that went in. She had slipped down but had the good sense to shoot anyway and came up with a score. Lebanon’s pressure defense was very good (eighteen steals) but Jane White was able to make enough plays for herself and her teammates (three assists) to carry the day. If the Raiders had been able to entirely deny the Bentley-bound senior the ball more often things may have ended differently. 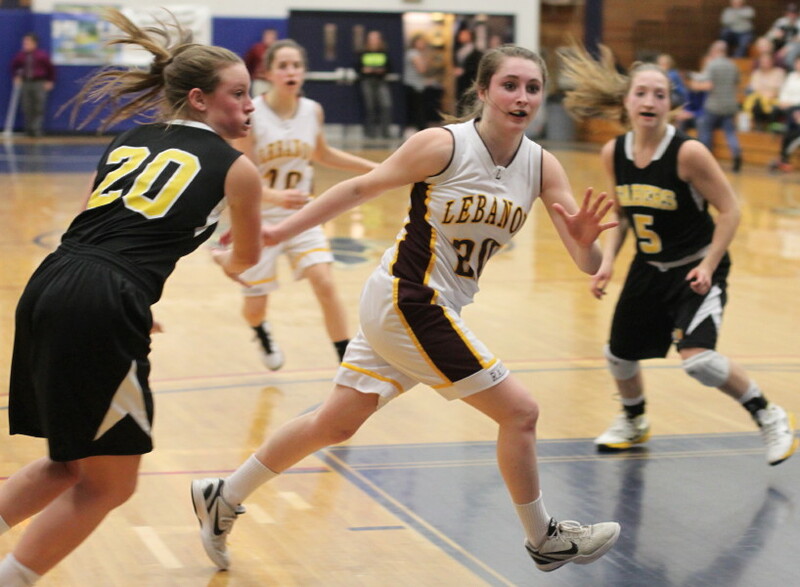 While the team from Amherst had the ball in Jane White’s hands most of the time, Lebanon ran well organized patterns and had plenty of good looks. 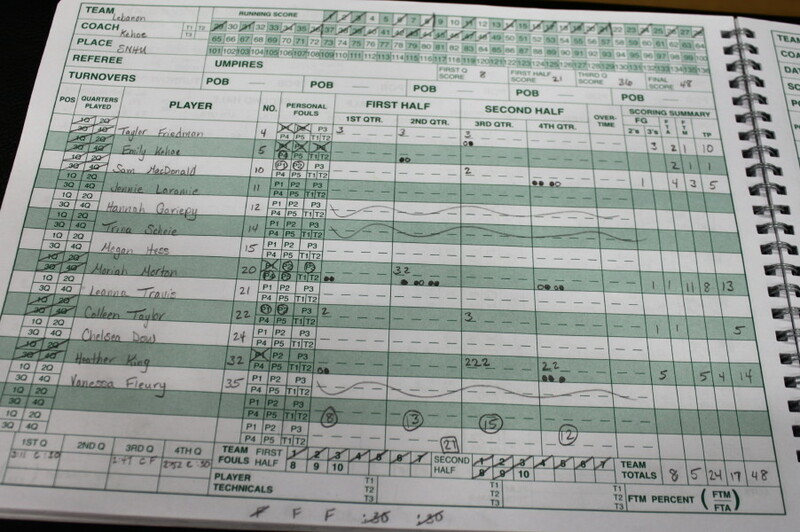 Their scoring was balanced – Heather King (14), Moriah Morton (13), and Taylor Friedman (10). 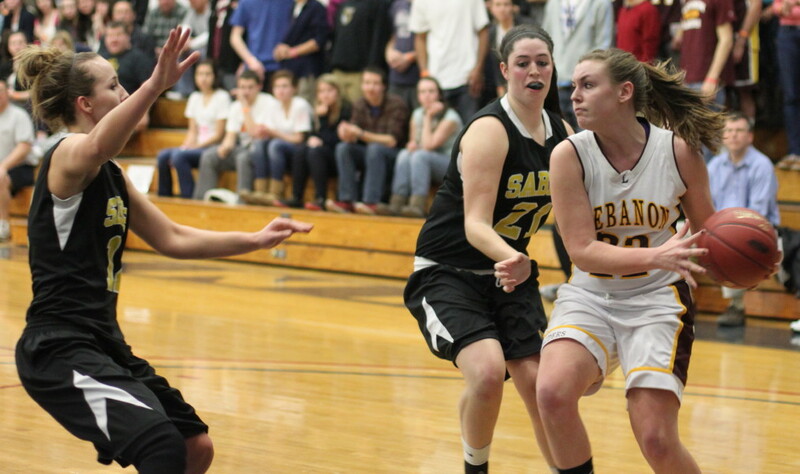 Colleen Taylor (St. Joe’s next season) had a rare off night getting just five points but she did have nine rebounds. An estimated crowd of 525 was on hand with both schools well represented. 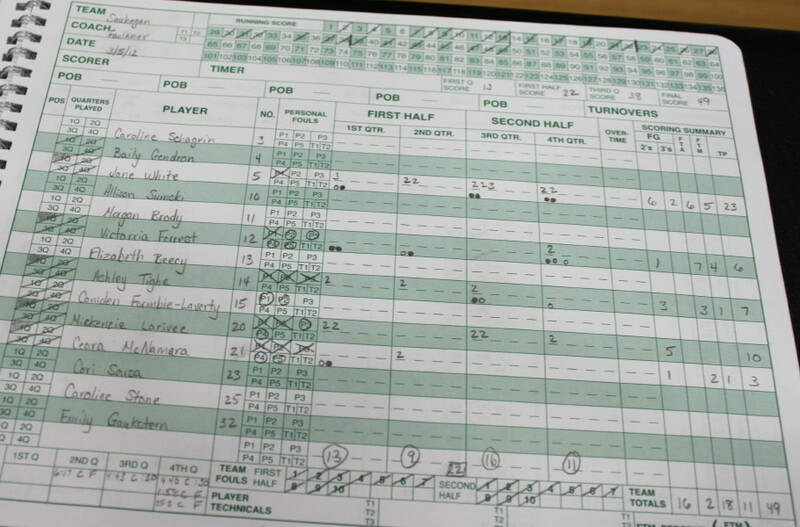 This was the first NH girls’ game I have done this season. Most of my coverage is in Massachusetts. There is nothing quite like the excitement of a close do-or-die tournament game no matter where it is played.